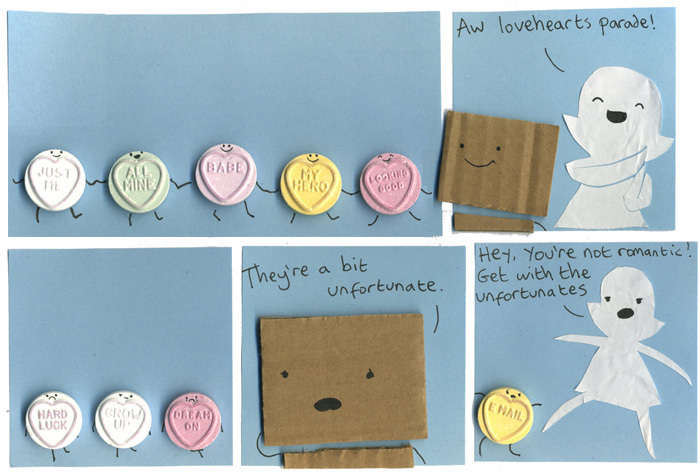 where do you find the sad lovehearts?!?! They were just in there with the normal lovehearts. There’s always a few sad ones. I like the embossed words better. American “Sweethearts” are usually so badly printed that I can’t read more than one in five. Yeah, ours are called Sweethearts and they’re made out of bone meal and earwig honey. These hearts are way more precious looking with the emboss words & pastel colours. Should “Just Me” go with the unfortunates? Does he mean “It’s just me here, all alone” or does he mean “She loves just me”? Most of those messages are open to some interpretation. I once had a “conversation heart” that said, “GO AWAY,” followed immediately by one that said, “GET OUT.” “Fax me” is another favorite. In Canada our love hearts look a lot different. They’re the same as the US ones. Every year a commitee votes on a new message to put on the sweethearts to represent the times. When they no longer make sense, they are phased out. This year “Tweet me” was added. The previous year, I think it was “facebook me”. “Fax me” will soon be phased out. I just found this comic again and its making me laugh all over again! Just the way Pauline says “get with the unfortunates” is sooooo funny! Haha this comic was made on my 10th birthday!